Advisors provide debriefs to help participants understand their report results. Debriefs may take place in person or by phone. Plan on 1 to 1½ hours for your debrief. You are welcome to invite parents, spouses or significant others to attend your debrief session, just remember, topics discussed may include sensitive areas such as your strengths and weaknesses. Our goal for a debrief session is to encourage you and give you key memory points as a take-a-way, including suggested verses to ponder or memorize. Your top gift mix may include more than the two gifts outlined in your report. If this is the case, your advisor will help you understand all of your top gifts. Your advisor will also help you understand how to use your MGM results to filter your life’s major decisions. Advisors are independent of Life Outfitter and usually charge a fee for their services. “It was very valuable for me to rethink the process from a different perspective. It was a gentle, encouraging nudge to not be pressed about results, but to relax and focus on process and God bringing unity." 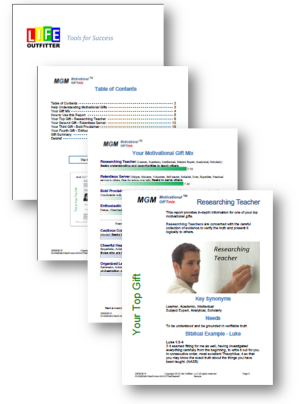 “Our church body benefited greatly from the time spent with Alex and Ken reviewing the results of the MGM questionnaire. People were infused with new passion as they discovered who God made them to be. We saw a definite increase in the number of people engaged in purposeful ministry."